Every month of April, when spring is in the air, Korea celebrates the presence of the Cherry Blossom all over the country because it signifies that spring has officially started. That means, a warmer weather, a better opportunity to go out and travel and most of all, a more colorful surrounding courtesy of the beautiful spring flowers of Korea that hibernated all throughout the Winter season. The azaleas, forsythia and royal azaleas are welcomed with different kind of spring festivals as they bloom to cheer you up and delight your eyes with its beauty. Above all of these beauties, cherry blossom is the most anticipated one. Spring is nothing without these white and pink petals we’ve known for the name Sakura. 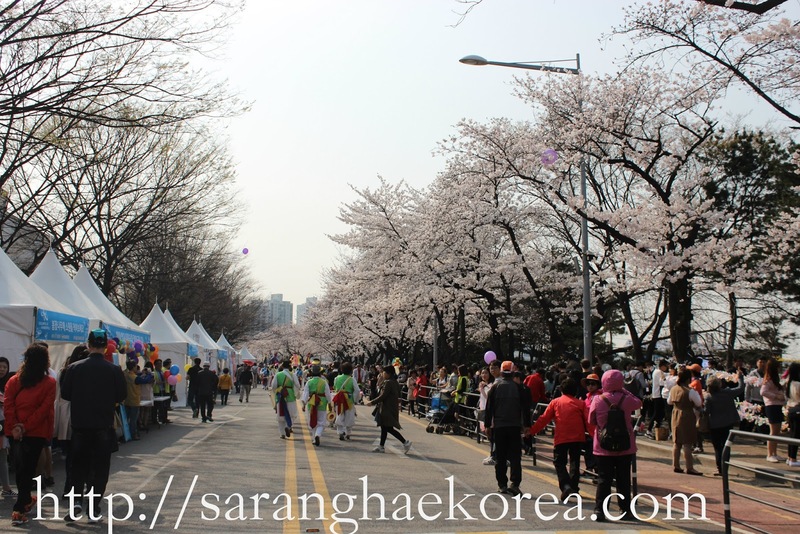 Among all other spring flower festivals, the one in Yeouido is one of the most crowded and visited spring flower festivals ever. 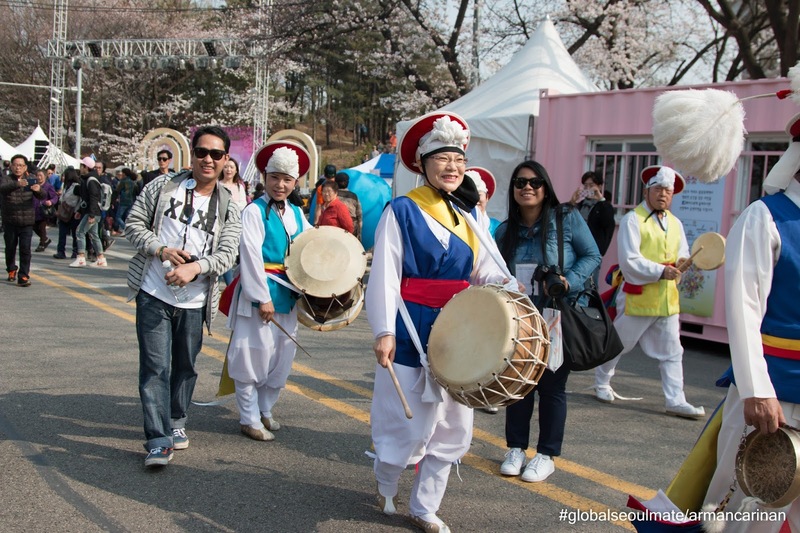 I was blessed that I was able join and enjoyed the Yeouido Spring Flower Festival during the Spring tour of the Global Seoulmates, an event organized by the Seoul Metropolitan Government. A friend dragged me into this event together with other Seoulmates coming from different countries like China, Malaysia, Mexico, Turkey and Russia. 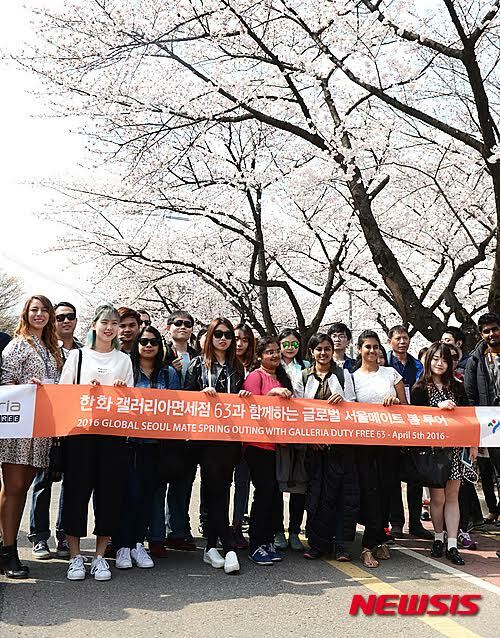 Attending the Yeouido Spring Flower Festival is part of the whole day tour and we were so entertained by the full bloom spring flowers especially the cherry blossoms. The whole road around the National Assembly was blocked so that no cars will pass through it just to give way for the crowd to own the place and enjoy the relaxing ambiance emitted by the spring flowers all over the place. People could not only enjoy viewing the flowers at day time because at night time, the cherry blossom trees are lit up with lights of different colors so it could still be seen by the onlookers. What really brought the festivities to the place during our visit was the different kind of entertainment you can see in the area. We, the global seoulmates, were treated to watch the “Pang show” or “Bread show”. At first I thought it was a show on how to make a bread, but it’s actually a comedy show. We laughed our heart out as the performers tickled us with their slapstick act. Aside from the bread show, there’s also a concert, there’s a magic show and there’s a band parade presenting the talented “ahjummas” and “ahjussis” showcasing their talents in playing band instruments. So really, it was a fun event to attend. Now I know why Yeouido Spring Flower Festival is crowded every year they celebrate it. It’s not just about viewing the flowers and taking photos, it’s actually a show. Hopefully, next year, I can still attend another festival in Yeouido. Thank you also to the Seoul Metropolitan Government for taking us to this one of a kind event. What a beautiful reason for a festival! Cherry blossoms some how represent spring in full swing! The cherry blossoms are beautiful. I haven't ever been to Japan but I bet now is the perfect time to visit. It sounds like you had a great time at the festival too. Spring is a great time for a festival. I remember when my parents had cherry blossoms, they got all over the yard but they sure were pretty. This looks like a great time! I am loving all of the photos! What a beautiful flower festival! I would love to be a part of that some day! great photos! I have always wanted to be able to see the cherry blossoms in bloom. They have a display every Spring in D.C. that I always missed, but I would love to see them in Korea as well. I've heard so much about Korea's cherry blossoms and have seen incredible pictures through the years. Maybe one day I'll see it in person. I love this! What a freat reason to hold a celebration! The bread show sounds hilarious and your photos are beautiful. Ok, I would totally go for the flowers. Here spring just sort of explodes and one day there is nothing and the next there are flowers everywhere! Are there a lot of bees? I would think that with all those blossoms the place would be buzzing. Seeing it a cherry blossoms in Korea is definitely on my bucket list. Your photos are absolutely beautiful and this festival looks like so much fun! The Spring Flower festival sounds so fun to attend. Would love to go. I love Korea. I would love to go there someday. It's still on my bucket list. Wow looks like the festival was a hit I would love to visit Korea someday. You really have some nice photos of the event thank you. One of my dream is to visit South Korea during the Cherry Blossom season! Would be so amazing! What a cool festival. I love experiencing different cultures by going to festivals. this looks like a great festival. i have always wanted to visit Korea. I have a few co-workers from there and it sounds like a nice place to visit. Ah! Cherry Blossoms! I would love to see this someday. Thanks for the post!